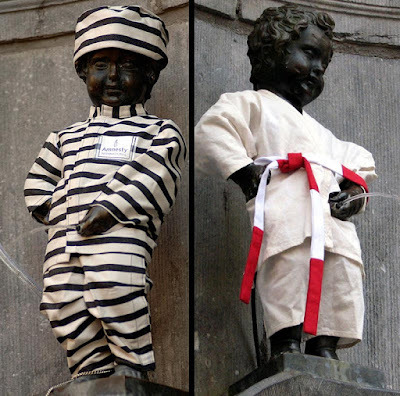 The Mannequin Pis statue dons a prison uniform. Did he get caught and arrested for urinating in public? Humans are not the only one getting dressed in costume for Halloween. Translated as “little man pee,” the Manneken-Pis statue in Belgium is a two-foot-tall bronze statue of a little boy peeing into a fountain. It was designed in the 17th century by a man named Jerome Duquesnoy, and it has been surprising visitors ever since. The Manneken-Pis is one of Belgium's most well-known cultural icons. The statue itself is naked, but locals are constantly dressing him up for holidays, events or just for fun. His outfits have ranged from judo to Dracula to Santa Claus and many more. They even occasionally hook the little statue up to a beer keg, and the Manneken-Pis will pee in your beer mug. Another tradition is at the U.S, Naval Academy in Annapolis, Maryland. The midshipmen paint the Tecumseh Statue on Campus. the bust of the Indian chief is believed to be a good luck charm of the students, who toss pennies at it for luck. For special occasions, like the Navy-Army football game, it is decorated with warpaint. Most of the year, it stands in its natural grey stone state.